Rank and organization: Rear Admiral (then Captain), U.S. Navy. Place and date: Hoa Lo prison, Hanoi, North Vietnam, 4 September 1969. Entered service at: Abingdon, Ill. Born: 23 December 1923, Abingdon, Ill.. Citation: For conspicuous gallantry and intrepidity at the risk of his life above and beyond the call of duty while senior naval officer in the Prisoner of War camps of North Vietnam. 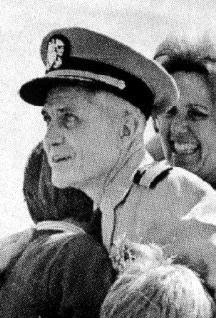 Recognized by his captors as the leader in the Prisoners' of War resistance to interrogation and in their refusal to participate in propaganda exploitation, Rear Adm. Stockdale was singled out for interrogation and attendant torture after he was detected in a covert communications attempt. Sensing the start of another purge, and aware that his earlier efforts at self-disfiguration to dissuade his captors from exploiting him for propaganda purposes had resulted in cruel and agonizing punishment, Rear Adm. Stockdale resolved to make himself a symbol of resistance regardless of personal sacrifice. He deliberately inflicted a near-mortal wound to his person in order to convince his captors of his willingness to give up his life rather than capitulate. 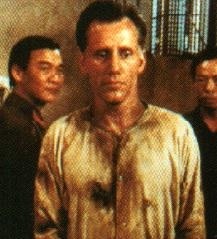 He was subsequently discovered and revived by the North Vietnamese who, convinced of his indomitable spirit, abated in their employment of excessive harassment and torture toward all of the Prisoners of War. By his heroic action, at great peril to himself, he earned the everlasting gratitude of his fellow prisoners and of his country. Rear Adm. Stockdale's valiant leadership and extraordinary courage in a hostile environment sustain and enhance the finest traditions of the U.S. Naval Service.